If that thought crossed your mind within the last 24 hours, you’re among the a rare, gilded group of naturalista elites (and you need to share your secrets with the community *wink, wink* *nudge, nudge*). So what about you, curly? Is the mere thought of your curls giving your heart a twinge because of escaped moisturizing opportunities? There’s a prescription for your mane malady: a protein-rich moisture treatment, combined with a renewed approach to wash day! Follow the recommended hair care steps in this sponsored post. You'll learn how to perform a holistic moisturizing routine and apply a protein treatment for your curls with the help of Nature’s Protein Coconut Restore. If you have curly hair, it's probably experienced dryness at some point during its growth. This dryness is a form of damage, especially if you haven't been able to moisturize on a regular basis. To begin the process of restoring your curls' health and natural luster, follow this moisture and protein treatment-focused routine below. 1. Replenish as you shampoo those curls. The restoration process begins with a head of clean curls. When you work your Moisture Replenishing Shampoo into curls, you're simultaneously cleansing them while prepping them for styling with key ingredients shea butter and coconut oil. This is good news because coconut oil has antibacterial properties while shea butter brings moisture back to dry curls and prevents itchy scalp. Now you're ready to section your hair and apply a conditioner. 2. Strengthen strands with a hearty conditioner. Your new, protein-rich Daily Strengthening Conditioner fortifies upon first application. To fortify, apply your conditioner with care to each section of hair. Thanks to milk protein, the anti-breakage strengthener, and pantheon, a high fiber fortifier, your curls will be able to withstand virtually anything nature throws at it. 3. It's time to meet the hero of your moisture treatment. This is the moment you've been waiting for... to meet the head moisturizer in charge. Allow me to introduce you to your hero: Intensive Repair Masque. You're going to apply this masque, from root to tip, on to finger-detangled hair. Then cover curls with a shower cap for 5 to 10 minutes for optimal results. Let the masque save your curls by adding coconut and linseed oil, and hydrolyzed wheat protein, which is a natural thermal shield and will strengthen hair fibers (aka, the main component to this particular moisture treatment). I know that you're a fan of this amazing masque, but you will have to rinse it out for the next step in this moisture treatment. 4. Add even more moisture to curls. The curl moisturizing party isn't over, my friend. It's time to grab your Curl Control Leave-In Conditioner to add shine enhancing jojoba oil and curl calmers Vitamins A and E. This soothing leave-in will help you combat environmental damage throughout the day. Even when you apply it, from root to tip, to dry curls you'll love the instantly refreshed feel of your curls. Work this leave-in through your curls with enthusiasm so that you can move forward with applying your Revitalizing Whipped Coconut Oil next. 5. For pillow-soft curls that stay hydrated, grab coconut oil and a gelée. Now that you've given your curls a serious moisture treatment with a gentle cleanse, protein masque, and curl-loving conditioners, you need to lock the moisture in! First, emulsify and apply your Revitalizing Whipped Coconut Oil with your hands on wet curls to add shine and protect your curls from environmental damage. Now, all you'll need is a styler that contains a humectant and has strengthening components. Aren't you in luck? It just so happens that your Styling and Setting Gelée has both, with moisture retaining honey (humectant) and amino acids (strengthening to prevent breakage). So, will this at-home protein treatment repair your damaged, dry curls? You know that there's only one way to find out. Try it! You'll be saying, "Wow! My hair looks amazing today." ....every day! 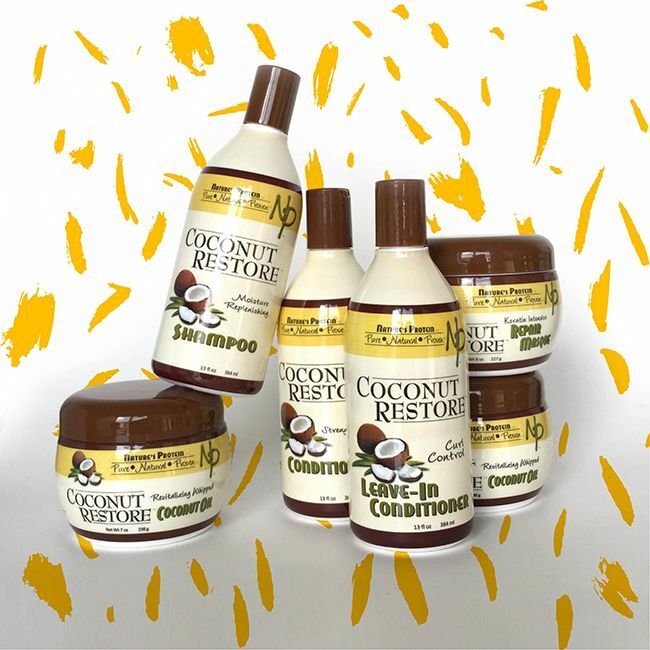 Nature’s Protein Coconut Restore is here to add life to your current moisturizing treatments and styling routines. This is very exciting news for you because you don’t even have to wait to get these products in your home: you can purchase them by clicking on the product images below! Enter the Nature’s Protein Coconut Restore Giveaway now! We’ve partnered with Nature’s Protein to give you the entire Coconut Restore line for free when you tell us why you need this moisture treatment and care routine for your curls.